There you go, folks. 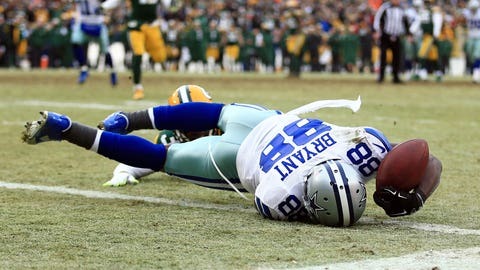 Turns out Dez didn't catch it. One of the biggest controversies came at the most crucial moments during last year’s playoffs. With the Dallas Cowboys facing fourth down and a little over four minutes remaining, quarterback Tony Romo threw a 31-yard pass down the left sideline to wide receiver Dez Bryant. Bryant grabbed the ball with both hands, took two steps before falling to the ground, squirting the ball free. While it was initially ruled a catch at the Packers’ 1-yard line, the play was challenged by Packers head coach Mike McCarthy and later overturned by referee Gene Steratore. Nearly everyone has an opinion on how the Bryant catch/non-catch should’ve been ruled. As the Cowboys prepare to enter training camp, team VP Stephen Jones recently admitted that the call was correct. FOX NFL Sunday rules analyst Mike Pereira gave his final ruling of the play on Thursday via his Twitter account, reporting that the NFL has rewritten the rule affecting plays such as that one. control proir to the ball touching the ground, the pass is incomplete." There you have it. Now are you less confused? Oops. If he regains control prior the ball touching the ground,the pass is complete.